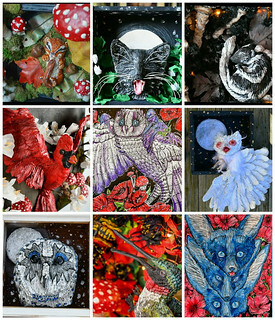 Cat Swartz is creating art, nature & fantasy infused sculptures, illustrations, etc. 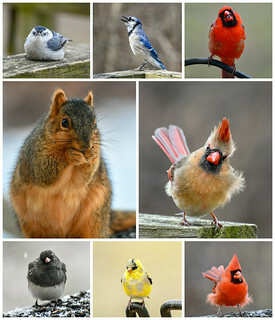 Hello, I'm Cat Swartz, an independent vegan artist that is strongly inspired by nature & imagination. I reside & work in my native hometown nestled in Northeast Ohio. I typically sculpt in polymer, epoxy, thermoplastic, cotton, wire, & paper. Hand color layers in inks, acrylics, and/or pastels. 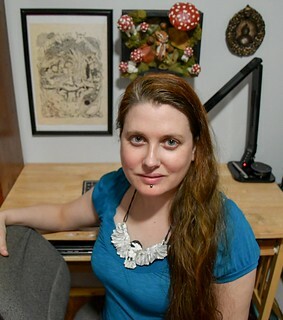 I am also an illustrator, photographer, printmaker, dollmaker, & jewelry designer. See some samples of some of my photography, sculptures, & illustrations below. It's becoming more difficult to reach my entire audience on social media outlets due to algorithms, & thus, oftentimes, I'm not seen in my many art posts. So, it's time to make a change, take charge, & give exclusive access to my exclusive community by means of using Patreon. Onward to create a next chapter! I'm here to create more possibilities for my work & grow as an artist. You have the exclusive opportunity to be in the front row seat of this journey. I'll be sharing my exclusive work in progresses, some mentoring & how-to tidbits (from sculpting, photography, etc), funny bits & stories, behind the scenes views, etc. I hope that you join me to be an exclusive guest inside my studio & join in my exclusive community. Oh, what fun we will have, I cannot wait to share more with you & learn more about you on the way, too! Let's begin getting digital, sneak peeks, & more! Contribute to the arts, a cyber pat thank you on the back. Exclusive Patreon posts, some introspective thoughts on current pieces, some music & audiobooks that I may be listening to, and welcomed input from you about what you'd like to see next. See some of my finished photography posts here first before it hits social media. Sometimes some additional story & perspectives behind the shots, too. Exclusive photography editing tutorials of photos that may need extra work. Exclusive larger image views than what you will see on my social media posts. Exclusive photo downloads for phone &/or desktop backgrounds. 10% discount off of retail for original pieces & most prints. Occasionally may share some exclusive baking/cooking tips, photos, & videos from my personal vegan baking experiences as an experimental vegan baker. Exclusive Patreon posts & everything else in previous tier, cyber pats, & gratitudes. More exclusive downloadable images for phone backgrounds and/or desktop backgrounds. Exclusive Patreon posts & everything else in previous tiers, cyber pats, & sincere gratitude. Advanced opportunity at brand new completed original art after real photoshoot. Opportunity to win in bimonthly drawing for a free print or something that I randomly shall conjure related to my work. Full Resolution Download & more chances to win! Get one extra chance (tosses your name in the hat twice) to win art prints, or other random goodies in the bimonthly drawing! Exclusive Patreon posts & everything else in previous tiers & sincere gratitude. A physical, signed with a custom message, high quality print postcard, greeting card, or 5"x7" print sent to your mailbox. Additional chance to win, get your named tossed into the hat one more additional time. You now have 3 more chances to win! Flat Envie Dream Comes True! Exclusive Patreon posts & everything else in previous tiers sincerest gratitude. Get an envie stuffed with a few newly printed flat goodies once per month, sent right to your door! Depending on what I print that month, you are looking at anywhere from no fewer than 3 quality prints (or flat item prints) & possibly up to 6 prints each shipment! Exclusive Patreon posts & everything else in previous tiers & sincerest gratitude. Get at least 1 high quality print or printed product (or a mixed stash of multiple goodness) of my choosing every 2 months. Example: stretched canvas print, metal print, blank greeting cards, totes, pillow covers, print book, mugs, posters, etc. You might get a good sized canvas one month of a design, or whole box of goodies. No repeat prints. Once these tiers fill, I will share what you will be receiving each month in Patreon posts. You will be put into a very special drawing with those in this level & higher, winners will receive an extra award with each shipment that is every other month. Original Shadow Box Sculpture & MORE! Getting close to my overall goal is to expand my expertise with more financial power to invest in more high quality materials & the tools that I need to continue to create & expand my body of work. Upon reaching this goal, all FOLLOWERS & PATRONS will be put into a drawing to win a physical print or original drawing..